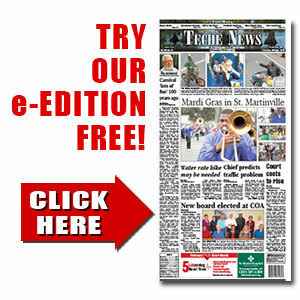 Joseph ‘JC’ Clairville Bienvenu | TecheToday.com | Teche News | St. Martinville, La. St. Martinville – A Mass of Christian Burial was celebrated at 11:30 a.m. on Monday, November 13, 2017, at St. Martin de Tours Catholic Church for Joseph “JC” Clairville Bienvenu, 70, who passed away on Thursday, November 9, 2017, at Landmark of Acadiana Nursing Home. Visiting hours were observed at the funeral home from 4 p.m. until 7 p.m. on Sunday and continued on Monday at 9:30 a.m. until 11 a.m.
A rosary was prayed at 6 p.m. on Sunday. Rev. Ed Degeyter officiated at the Funeral Mass. Readers were his goddaughter, Renee Gauthier, and Bridget Latiolais. Gift bearers were Hannah Latiolais, Lin Boudreaux and Michelle Russo. A lifelong resident of St. Martinville, Joseph was known to friends and family as “JC.” For many years, JC was an active HAM & CB operator and he enjoyed the great camaraderie and friendship among the radio community. JC was a devout Catholic and a loving Christian. He particularly enjoyed the rosary and he shared daily recitations with his fellow residents at Landmark of Acadiana Nursing Home community. He also enjoyed making hand-knotted rosaries, which he donated to hospital patients and friends. He was an avid Right to Life advocate, and he actively participated in Right to Life Missions. A talented organist and pianist, JC enjoyed playing for others. He was also an active participant in the Facebook community, where he enjoyed many online friends. But more than anything, JC loved people. He considered all strangers as friends he simply hadn’t yet met. He often stated, “I don’t know what it is about me, but people love me ...” and he was right! He is survived by his sisters, Sonja Bienvenu Dupois and Estelle Bienvenu Labbé; brother, Raymond “Eboo” Bienvenu; nieces, Renee Labbé Blanchard, Judy “JuJu” Labbé Greig, Roberta Bienvenu, Carolyn “Lin” Bienvenu Boudreaux, Alicia Bienvenu Cousin, and Michelle Bienvenu Russo; and nephews, Robert “Robbie” Labbé, Raymond Bienvenu Jr., James “Jimbo” Bienvenu, Peter Paul Bienvenu and Douglas Bienvenu. He was preceded in death by his mother, Elia “Mom Dune” Breaux Bienvenu; father, Lee “Dune” Bienvenu; baby sister, Grace Bienvenu; brothers-in-law, Sidney Dupois Jr. and Robert “Bob” Labbé. Pallbearers were Raymond Bienvenu Jr., Peter Paul Bienvenu, Scott Blanchard, Clay Ortego, Don “Tuffy” Resweber and Chad Latiolais. Honorary pallbearers were Robert “Robbie” Labbé, James “Jimbo” Bienvenu and Pierre Rex “Rocky” Landry Jr.